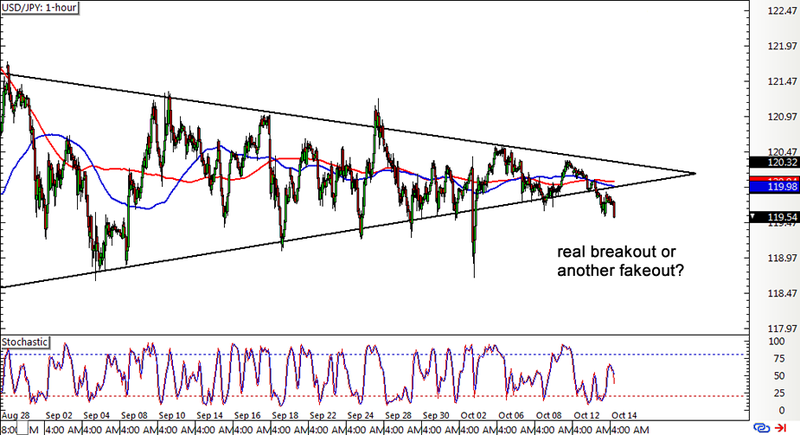 Are we finally seeing a legit breakout from USD/JPY’s symmetrical triangle forex chart pattern? It looks like the pair is going for another downside break, which suggests that a downtrend is about to take place. This potential selloff could last by around 300 pips or roughly the same height as the triangle formation, possibly taking price down to the 118.00 levels. Stochastic is pointing down while the 100 SMA is edging below the 200 SMA, hinting that bearish momentum is building up. However, that previous spike lower shows that this pair isn’t immune to fakeouts and might still be able to find its way back inside the triangle once more. Better review our lesson on How to Avoid Fakeouts if you’re looking to trade this one! 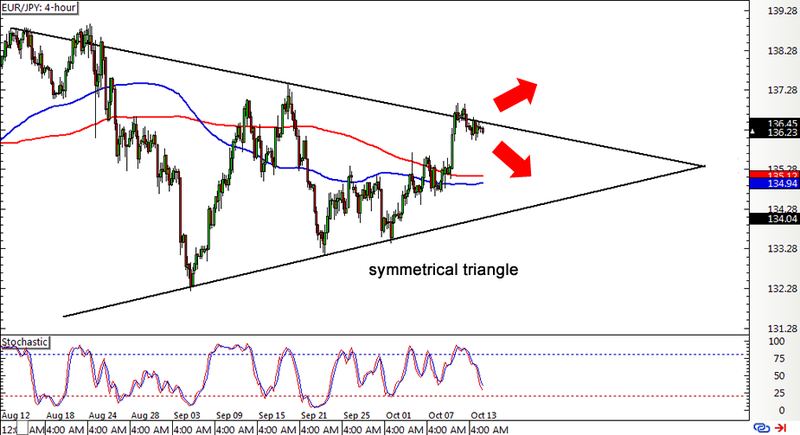 Here’s another symmetrical triangle setup on a yen pair! EUR/JPY is currently testing the triangle resistance on its 4-hour forex chart and might be due for a move back towards the bottom near the 134.00 major psychological level. Stochastic is heading south, which means that euro bears are on top of their game, while the 100 SMA is treading below the longer-term 200 SMA. An upward crossover from the moving averages, however, might indicate that euro bulls are ready to charge and push for an upside breakout. The pair seems to have formed a bullish flag pattern right on the triangle resistance so a rally past the recent highs around the 137.00 mark could show that further gains are likely. Note that the chart pattern is around 700 pips tall so the resulting uptrend could last by the same number of pips. 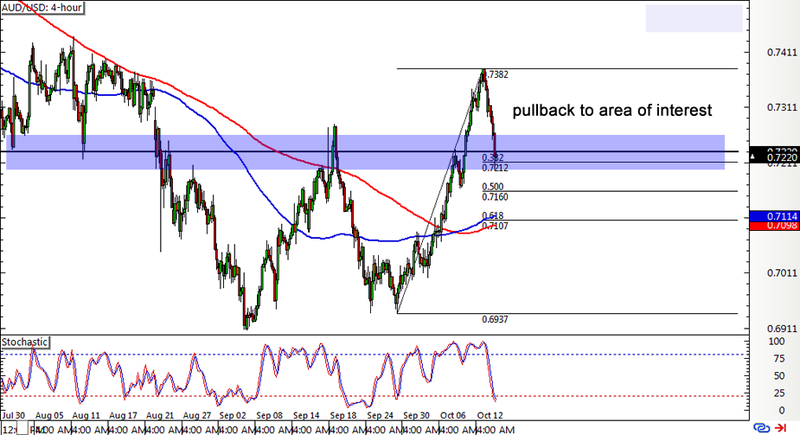 If you prefer trading retracements, then you might like this pullback situation on AUD/USD’s 4-hour forex chart. The pair recently broke above the neckline of its double bottom formation, indicating that an uptrend is underway. Price shot up to a high of .7382 before Aussie bulls decided to take it easy and retreat to the broken resistance area. This coincides with the 38.2% Fibonacci retracement level and is close to the .7200 major psychological mark, which might be enough to hold as a floor. Stochastic is almost in the oversold zone while the moving averages are making an upward crossover, indicating that the rally might resume sooner or later. If the pair is in the mood for a larger correction, the 61.8% Fib near the moving averages seems to be the line in the sand.